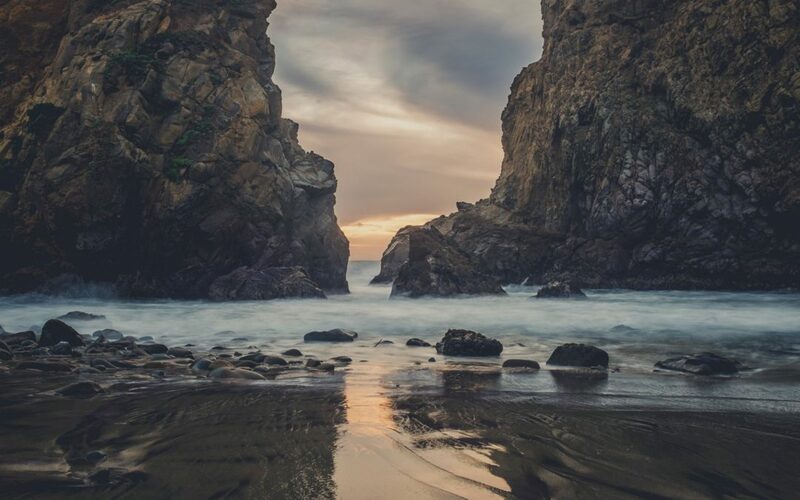 All the rivers run into the sea, yet the sea is not full, says the King in Ecclesiastes. To the place from which the rivers come, there they return again. Vanity, he exclaims, because everything is temporary. I wonder if this was a lamentation or a poetic expression of his observations. In the eyes of an incurable optimist, however, as I am, the metaphor takes on a different light. Isn’t it a wonder that the sea is never full? All the waters lead to the sea and yet they come back to us. They are transported to where they started, and round and round they go. As they ride in their atmospheric carousel, along the way, they bless all kinds of living things. The soil is dewed and refreshed, the trees drink freely, and the thirsts of creatures and mankind are quenched. Nutrients get transported from one place to another and dirt gets washed away. I am sure glad that the waters move and travel, even though they return to the same place over and over again. Imagine riding a water molecule, witnessing the trajectory of its life cycle on this planet. The places it visits, the people it sees, the calamities it may take part in—these would make quite a story. When it ends up in the sea, the sun may kiss it and lift it up to the sky. It may get frozen there to return to earth or it may retire in the Arctic. In an age of declining fresh water resources, I treasure this water cycle from land, sky, and sea as the largest desalination process our world has. There’s much good and meaning in this blessed movement. The sun also rises, and the sun goes down, and hastens to the place where it arose. The wind goes toward the south, and turns around to the north. The wind whirls about continually, and comes again on its circuit. The sun may be doing the same thing every day, but boy, what would we do if it decided to not arise. How would we miss its warmth and light, and its life-giving power. The wind that goes from north to south carries pollens for the trees, moving animals and humans here and there—a life in transit. Transience, it seems, is the essence of life. Life moves, and I think it is good that it does so. Nature hums in a rhythmic fashion, and we, humans, are still part of this dance no matter how much we exert our controlling powers. There’s a rhythm that we cannot escape—the rain that falls on us, the flight-delaying weather disruptions, the seasons that happen to us—we are subject to these things. One could take it as a depressive state, being trapped by nature, or one could instead surrender to the rhythm, understanding that it is much better to enjoy it rather than fight against it. Part of this rhythm, the cycle of life, is rest, a period of dormancy, recuperation, and restoration. The land needs it to continue producing food, animals need it to survive through winter, and mankind needs sleep, among many other examples. The Sabbath, the seventh day of the week, is synonymous with rest. As such, its inclusion in human life is incredibly appropriate. It is the dormancy to activity, the withdrawing to assertion, the restoration to production. To stop on the Sabbath when the sun sets on Friday evening requires a surrender, a certain trust, that things won’t fall apart when we’re not attending to them. This stopping can generate anxiety, because we may have been convinced of our importance and responsibility for six days. What if I don’t check my email? What if something goes wrong? We may think we’re indispensable. Yet honoring the Sabbath is an art of quieting ourselves from these anxieties, a reminder that the world will not likely end because we stop for a day. The Earth has been here before us and will be here after us. That’s something we can take comfort in. The Sabbath is meant to bring a kind of nostalgia—hence the words, “Remember the Sabbath day to keep it holy”—of another world in another time. The book of Genesis narrates that mankind was created last, when the rest of creation was finished. Adam and Eve came when the world was already done, to a finished world, and their first day was to be the Sabbath. In it, there was enjoyment, trust, and surrender, because God had done the creative work, and nothing unfinished depended on them. The Sabbath today carries this memory from Eden. A glimpse of paradise, I’m convinced, because we too can trust the same power that created and sustained the universe to take care of everything for one day. We too can rest, and be carried away in this rhythm of creation. “Where did the time go?” we often ask, and no matter the frequency of this conversation, it’s never boring, because we feel its truthfulness each time. Blink once, it’s Monday, blink twice it’s Thursday, and so the weeks, months, and years pass by. Age, I hear, accelerates this experience, and I can probably agree. It took forever and a half to reach age 10 and another half to 17. But to the observing adults, my aging probably did feel fast. They certainly talk about the flying time with more intensity. Mathematically, it’s been explained that the ratio of a fixed amount of time, say, a year, to the total length of our growing lifetime will only diminish, hence the increased speediness. It’s perfectly rational. I like rational. But, if the math is the real cause of the experience, how scary is that? It means life will only move faster and faster, like a runaway train that’s gone out of hands. Is there nothing to be done about it? 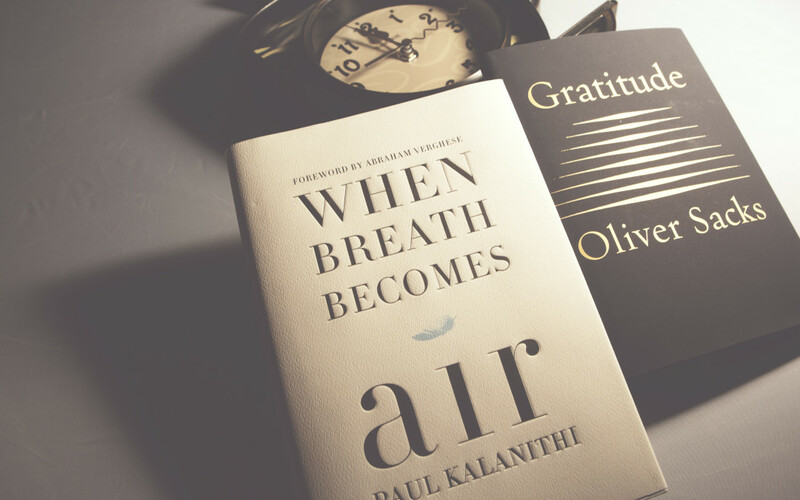 Reading Oliver Sacks’ Gratitude and Paul Kalanithi’s When Breath Becomes Air tells me that there may be a way out. Written when their authors were cancer-ridden—the first, a collection of essays written during Oliver’s last two years of his life and the second, written during the two years between Paul’s diagnosis and his death—both writings seem to know how to slow time down. Faced with the finiteness of their lives, these authors mastered the art of living consciously (isn’t this why time feels fast—it goes by and we are not conscious of it) and thus put a break to the speeding train of time. The writing certainly feels that way, and in reading their words, my time too slows down. Consciousness of time, I think, is the kindred subject that occupied both men, evaporating the near half-century gap between their ages. Linked to this is also the fierce quest of meaning and the evaluation of their lived years. Confronting mortality, humankind is forced to reflect. What of my life? Has it been good, meaningful? Am I contented with who I am? And in reflecting, time is recaptured, somehow. Whether intended or not, Paul and Oliver’s writings have this recapturing effects on me. Their sense of sacredness in the time they had left produced words that grace their readers with wisdom. Yet, is this gift only possessed by those close to death’s door? I’m not dying–not that I know of, at least–and I too am covetous of this consciousness of time. Oliver’s last and poignant essay was titled “Sabbath,” published in the New York Times two weeks before his death last August, and one that was very important to him. As his days were closing, he found his thoughts drifting back to the Sabbath. I wonder if the Sabbath was made so that humankind would live, in the deepest sense of the word, with consciousness of time. The gift of rest in the Sabbath surpasses the physical realm into the essence of life itself. This infusion is not automatic—I’ve lived Sabbath to Sabbath my entire life and I know that Sabbath too can be busy—but it is a space and time carved out to stop and reflect each week. Did I do well? Was I good? Did I do things that matter? The observance of the Sabbath is extremely beautiful, and is impossible without being religious. It is not even a question of improving society—it is about improving one’s own quality of life. For example, let’s say I’m taking a trip a couple of hours after the Sabbath. Any other person would spend the day packing, going to the office, making final arrangements, final phone calls, this and that. For me it’s out of the question. I do it on Friday. The Sabbath is there. The world stops. Peacefulness and remoteness from worldly concerns. What would it look like to live, entirely divorced from even the privilege of winning a Nobel Prize. It seems like Robert John estimated the prize very differently from most people; something else mattered to him more. Perhaps it was an understanding of ultimate things—what is the most important thing in life, what matters most, things we usually understand when death is nigh, when time is short. Perhaps the Sabbath is like speed bumps, preventing life from being overrun by the train of time. It is a reminder to be conscious of time, like a balance by which everything is scaled against eternity. The things that exist in the Sabbath realm are the things that matter in eternity—they will always matter—like family, friends, love, reflection, peace with God and peace with self. Everything else can take a pause, irrelevant for one day. I’m writing this at the entrance of a Sabbath. For the next 24 hours then, I’m going to live with consciousness of time. I’ll use their first names here to make the post more personal instead of academic. Read the whole interview with Robert John Aumann here. How would you describe this moment: standing on a precipice, you view the extensive terrains made up of lush green meadows, forests, and blue streams. Or at this time of the year, the orange and red leaves that signal winter’s coming. How would you explain what happens when in silence, you watch the evening’s sun sinks into the horizon? Perhaps this word would do for now: Wonder. Heschel would describe these as moments when one comes face to face with the ineffable, moments when we part with words. Awesome though they may be, I thought that these moments are like birthdays. They come rarely (only once a year), far in between, and you can’t ask for it. Until I saw that quote above, I never thought that I could ask for wonder. But when one has the God of the universe as Friend and Father, why couldn’t one ask for wonder? It’s like saying to God, “Impress me.” Why, of course He’ll do it! Talk about a guaranteed answer to prayer. God is mysterious and His ways are past finding out. I like how there are many, many things that I don’t know or understand about God. He keeps me curious and amazed, and I can actually ask Him to amaze or make me wonder, and be in for a real ’whoa’ experience. Romans 11:33 – Oh, the depth of the riches and wisdom and knowledge of God! How unfathomable (inscrutable, unsearchable) are His judgments (His decisions)! And how untraceable (mysterious, undiscoverable) are His ways (His methods, His paths)! Job 9:9-11 – Who made [the constellations] the Bear, Orion, and the [loose cluster] Pleiades, and the [vast starry] spaces of the south; Who does great things past finding out, yes, marvelous things without number. Behold, He goes by me, and I see Him not; He passes on also, but I perceive Him not. This post is my gratitude for the little surprises God had for me everyday this week (which is number 4 on the list). I don’t have to wait until I get to a mountaintop or the beaches in Bali to bottle up wonder and store it in memories. I can have a dose everyday, for to wonder is to worship. And far more incredible than to wonder at the grandeur of His creation, is to wonder at God Himself. Ask for wonder. You’re in for a real treat.